Two photographs of a young woman identified as Isabelle Bland Leavitt. One photograph identifies her as Bland Leavitt, so perhaps she went by her middle name. The photographs were taken at the studio of E. C. Nickerson at Portsmouth, New Hampshire. Neither of the photographs has an information on the reverse. 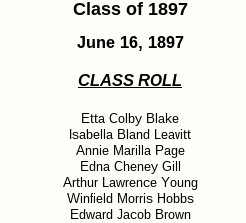 I found a reference online where Isabella Bland Leavitt was in the Class of 1897 at Hampton Academy and High School at Hampton, New Hampshire, so perhaps these photographs were taken at her graduation, or perhaps at the time of her marriage. Isabelle Bland Leavitt was born 27 October 1878 at Hampton, New Hampshire, daughter of George Odiorne Leavitt and Annie (Farrell) Leavitt, who were born at Hampton, New Hampshire, and in Ireland, respectively. On 15 July 1902 at Haverhill, Massachusetts, Isabelle married Benn Frank Damsell, son of Edwin and Mary Ann (Morrison) Damsell. One online reference had his name as Benjamin Franklin Damsell, but the records I found, including his World War I draft registration card, had his name as Benn Frank Damsell. I didn't find any children for them. They were living with Isabella's widowed mother at Hampton, New Hampshire, at the time of the 1910 Census. Ben was working as a barber. They divorced on 15 December 1915. Ben died 6 October 1918 at Lakeport, New Hampshire. Isabella, who was working as a private care nurse, was still at Hampton, New Hampshire with her mother at the time of the 1920 Census.